Models were asked to adopt a relaxed, meditative pose for a few-second video portrait. I kept the shot going for as long as possible, while the models eventually broke their commercial personas as they became impatient, uneasy, curious, or otherwise off-put. The video finishes with rather natural and un-commercial expressions as the models apologetically or impatiently return to their work. “To Build a Fire” takes its name from a Jack London story set in extreme cold. The video was shot in subfreezing temperatures in the old Artkraft Strauss billboard factory, on 57th Street in New York City. The film does (very loosely) adopt some of the story’s narrative structure, and shares the theme of the focus and beauty of a critical moment. In both works, seconds are stretched out and illuminated. The film is also about the contrast between wintry cold and the heat of sensuality--The visible vapor of a beautiful woman's breath marks the boundary and transition between warmth and chill. Enjoy! "Exquisite Corpse" takes its name from the surrealist drawing concept where four artists would work in succession on the same drawing. Each would draw one quarter of a figure without being able to see what the others had drawn. My video will involve four stacked monitors of obsolete technology, and will feature four channels of video building a moving figure out of disparate models--models of different gender, race, outfit, direction, physique. The result will be but an exaggeration of reality: an exquisite, extreme, sometimes ugly beauty. This project is in the editing stage. Starring the beautiful Laura Jo Anderson and introducing Italian/Croatian-American former model and current artist Danny Licul, this pensive comedy shows that even for romance between shy people nature always finds a way. "Portrait of Women," presented in 2009 at Ad Nauseum Lyceum's "My Eyes!" show in Manhattan, features a number of models, each of whom has done one or two 20 minute sittings. Each pose is broken into several-second intervals, resulting in a progression from model to model in a list that forms a collective portrait. The full-length video will be long enough to essentially rewire the viewer's brain through an experience of looking that is similar in focus to the experience of being a painter's model (or to watching a long, abstract Michael Snow film). The shot is a fairly tight close-up of the model's face. I sit directly to the left of a small camera, and the model and I gaze at one another for the entire session. In this sort of psychological experiment, an ordinary gaze transforms through various levels of interaction, attention and meditation. While it's different for each model, the attention between two people must change into something new as the normal interpersonal communication of a mutual gaze necessarily expires, leaving a personal communion with the self. The social act of looking at one another eventually becomes a meditative one, and many subtle transformations of expression are recorded. Each model is a beautiful woman, who while being filmed is being looked at by a man (me). This is an essential psychological and art-historical reflection. Looking at a beautiful woman, in a way that is taken out of its normal context, the viewer is presented with the paradox of the pleasure of beauty and the tension of both confrontation and his or her own limits of endurance. The psychological collaboration between artist and model is profound and infinite. The expressive possibilities of the presentation of the human face and physique will always captivate me. "Angel" Oil on canvas, 9' 2" x 7' 8", 2009. 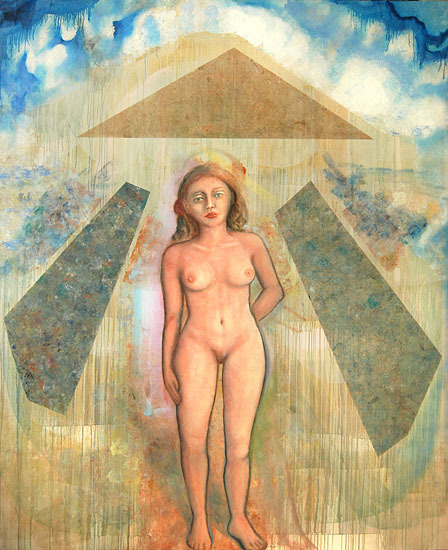 "Standing Woman" Oil on canvas, 80" x 48" 2009. "Angel Study: Two" Oil on canvas, 80" x 48" 2009. 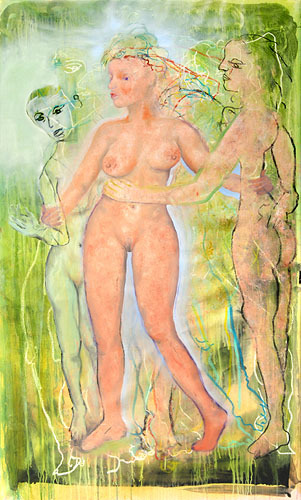 "Angel Study: Three Graces (Deceased)" Oil on canvas, 80" x 48" 2009. 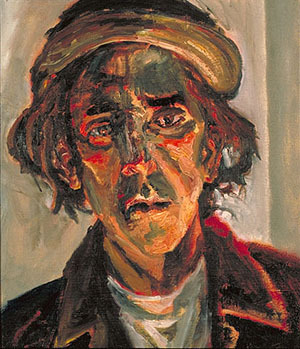 "Gerbstadt" Oil on canvas, 26" x 22" 1993. 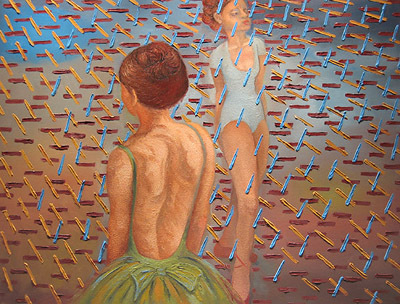 "Dancers in a Storm:" Oil on linen, 44" x 58", 2003.